Originally intended to be complete before O-Week began, the summer renovation project to make the street in Harper Quadrangle more pedestrian-friendly has been delayed to its current anticipated completion date of October 4. Currently, the north side of Harper quad remains closed to pedestrian traffic, blocking the east entrance to Haskell and west entrance to Stuart. Construction occurs from 7 a.m. to 9 p.m. on weekdays, and may be extended to weekends as required. A temporary path, marked with directional signs, connects the Main Quad and Bond Chapel. The project aims to make Harper Quad more bike- and pedestrian-friendly, as an extension of previous work on the main quadrangles area. “When I came here three years ago [the main quad] was all asphalt. It had service vehicles and cars all over it. Now it’s a pedestrian area. We’ve pedestrianized the quad. [That] was phase one. What we’re doing to Harper Quad is essentially the same thing. This is phase two,” Black said. Made of limestone pavers and pervious concrete, the new roadway will provide for better drainage in the winter and will reduce salt usage on the pavement. The existing sidewalks will be removed and replaced with grass. The renovation project began June 14, and Harper Quad and entrances facing the quad were inaccessible throughout the summer. 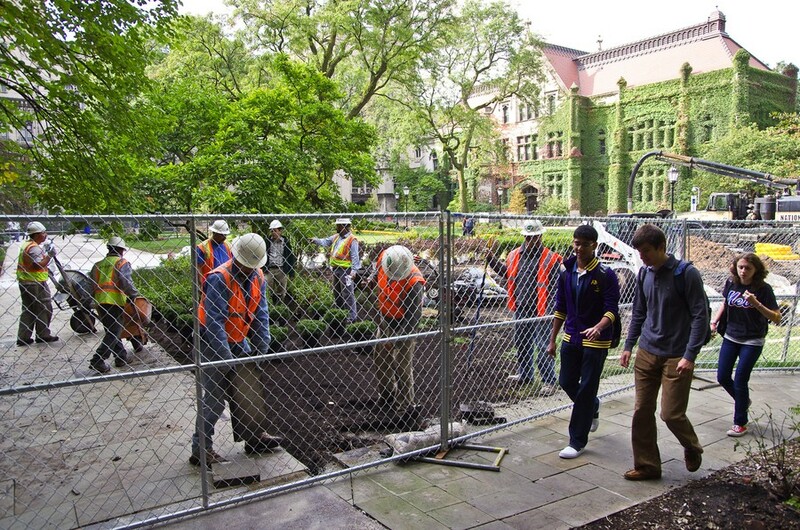 Fencing blocking the south side of Harper Quad was moved Sept 16, leaving only the front blocked off in order to alleviate some frustration.